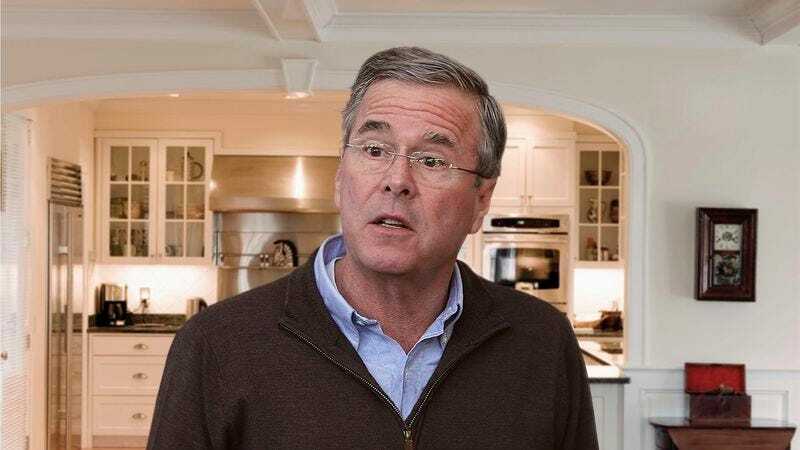 CORAL GABLES, FL—Noting how he repeatedly stumbled over his words and struggled to formulate convincing and consistent responses when asked by his wife about how he slept and what he wanted to have for breakfast, sources confirmed Monday that former presidential candidate Jeb Bush bungled numerous questions on his first day back at home. “You see—the thing is, breakfast—there are a number of options,” said Bush, anxiously reaching for a sip of water after delivering a meandering aside about why pancakes would be a reasonable choice, before awkwardly transitioning to a clumsy, forced anecdote about some bacon he recently had. “It’s an important question—you know what? Eggs. That’ll be—yes. Mmhmm.” Sources further reported Bush appeared helpless and forlorn after his request was drowned out by the louder, more confident answers from his children seated around the dining room table.